I love Sew Mama Sew (I became a Sew Mama Sew Contributor in September) and I enjoy spending hours entering giveaways and finding new wonderful blogs each SMS Giveaway Day. Who wants some mini barn quilt kits? I love this new product that my friend Terri Ann @Childlike Fascination launched earlier this year. I had a lot of fun creating my own Hexi Flower mini barn quilt kit, and I think you will enjoy getting to create them, too. I purchased two (2) kits that I am offering to you today: the Bear Paw and Carpenter Star. My name is Yvonne and I am a former aerospace engineer, hence the name Quilting Jetgirl. I am passionate about community and will be returning to co-host the 2016 New Quilt Blogger Blog hop, so stay tuned if you (or someone you know) are new to blogging for information and details early next year. In addition to my blog, you can find me on Instagram as QuiltingJetgirl. I sell my patterns and a selection of quilts via Etsy and patterns on Craftsy (Craftsy also has a couple of free patterns). Speaking of free, I also have a large selection of Tips and Tutorials that you might want to peruse. Now on to enter the giveaway!! This giveaway is open to anyone with a shipping address in the United States and is for two (2) Mini Barn Quilt Kits: Bear Paw and Carpenter Star. This giveaway starts today (Wednesday, December 9th) and will run until Sunday, December 13th at 9 p.m. EST. 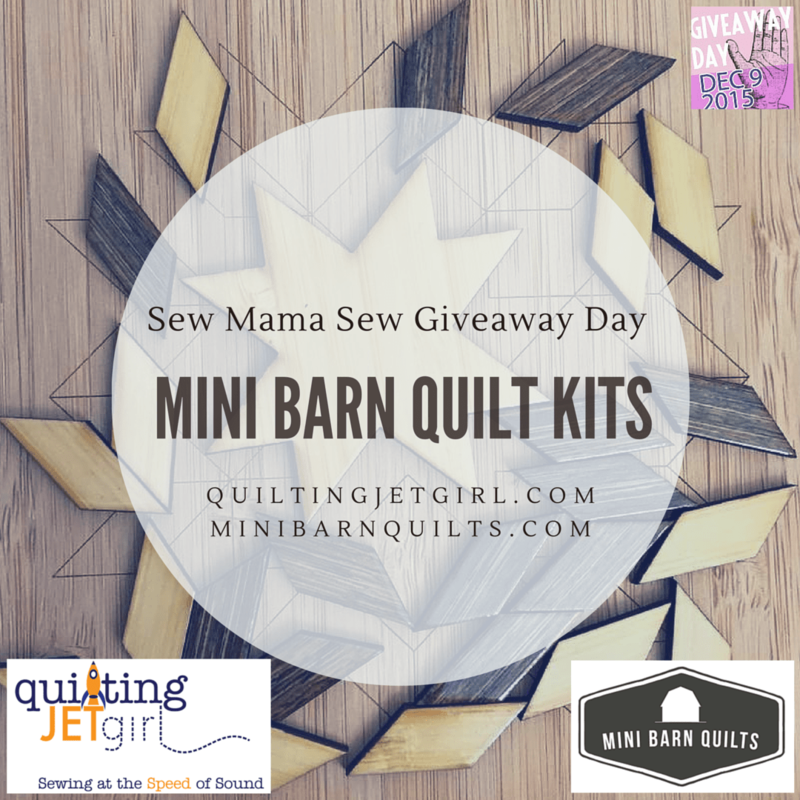 Mini Barn Quilts has generously offered to also ship a third mini barn quilt kit of your choice to the winner of this giveaway! 1. Leave a comment letting me know which of the six (6) mini barn quilt kits you would like from Mini Barn Quilts if you are the winner (Bear Paw, Hexi Flower, Arkansas Taveler, Carpenter Star, Flock of Swallows, or Missouri Star). 2. Old and new followers of Quilting Jetgirl alike may leave a second comment letting me know how you follow my blog (options available on the sidebar to the right: email, Bloglovin’, Feedly, Pinterest, Instagram, Facebook…)? I will email the winner as selected by a random number generator on Sunday night, so please double check the email address you use when submitting comments below! If I have not heard from and received a US shipping address from the selected winner within 48 hours, I will select a new winner. On normal posts, I try to respond to each and every comment and visit the blogs of those who comment, but on giveaway posts I am unable to due to the high number of comments. Thank you for your understanding. 202. I love this mini quilt pattern with the wood! Too awesome! I love the Carpenter Star. Thank you! 203. Love the Carpenter’s Star. Love your blog and look for your posts first. Thank you for the opportunity. 206. I follow on Instagram (I’m @muchoxoxo). Thanks for the chance! 207. I love these! I’d like the carpenter star. 209. These are adorable. I’d love the Arkansas Traveler. Many thanks! 210. I follow by email and Bloglovin. Many thanks! 213. These are so cute. If I win I’d pick the Flock of Swallows as the third kit. 214. I follow by email & Instagram & Periscope. 215. Hmm, that’s a hard decision! I really like the Bear Paw (sentimental reason, that was the first quilt block I ever made, and won the draw at my LQS, so I had to learn to quilt) but I also love Flock of Geese, the way Teri did hers. Then again stars are and always have been, my favourite block, so either star…see? I can’t pick! 216. my chioces would be… Bear Paw, Hexi Flower, and the Carpenter Star. Lovely giveaway, thank you for the chance. 217. I follow via e-mail and Facebook. 218. I like the Carpente Star. Those are so cool. 219. What a great giveaway, Yvonne! These are all fabulous, but I am most drawn to the Carpenter Star and Flock of Swallows. 223. The Carpenter’s Square looks like a lot of fun to assemble. 225. I love the Arkansas Traveler mini barn quilt! This is such a fun giveaway! 226. I already follow you on Instagram. 227. I would love the flock of swallows kit! 228. I follow through bloglovin. 229. I love flock of wallows, but they are all adorable! 230. I follow on bloglovin, and I mean swallows, of course. 231. I really like Missouri Star. 232. Bloglovin follower: Nicole Sender. 235. I like the carpenter star! 236. I follow via bloglovin. 238. also following you now via bloglovin. I love, love, love your philosophy section. Why aren’t more of us talking about the creative impulse, history, art, philosophical reasons and impeti for our creation/s???? thank you for putting this together!!! 239. These are so cute! Arkansas traveler or Missouri star! 240. The Carpenter Star is my favorite. Thanks for the great giveaway! 241. Arkansas traveler is gorgeous. 243. I would want Missouri Star. Thanks! 244. Oh my- these are so cute! The Bear Paw, Flock of Swallows and Missouri Star are all wonderful. How could I decide – I’d love any one! 245. I’m following you on IG (@ellie_be). I love the Arkansas Traveler as well! They are all adorable! 247. I love the Carpenter Star or the Missouri Star block. 248. I love the carpenter star! 249. I follow you via e-mail and I think Bloglovin’ or Blogger. 250. If I were choosing a third beyond the two great kits you’ve selected, I’d pick Flock of Swallows. All of them are just so darned cute.